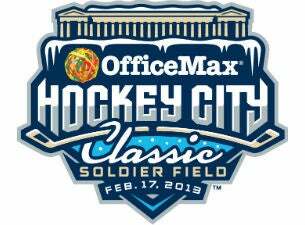 Here’s the first teaser spot for the Hockey City Classic. Good production values. Nicely done. It would appear this is going to be a first-rate event. Thanks to Miami’s incoming freshman netminder Ryan McKay (@RyanMcKay35) for pointing it out. Well, what we’ve known for some time became reality today as Miami, Notre Dame, Wisconsin and Minnesota held a joint press conference at Chicago’s venerable new Soldier Field to announce the inaugural Hockey City Classic. Aside from the egregious ripoff of Detroit’s “Hockeytown” mantra, the name and logo are both serviceable. The RedHawks will face CCHA rival Notre Dame in the two schools final regular season meeting as conference mates on Sunday, February 17, 2013. As of now, I believe this is technically a home game for Miami as the teams will meet on Friday, February 15 in Oxford, then make the five hour bus trip to the Windy City to complete the two-game CCHA weekend series. This is the first outdoor game in program history for both Miami and Notre Dame. Last year, Miami went 2-0 against Notre Dame as they swept an important home series by 3-0 and 4-1 scores as the RedHawks were streaking toward the playoffs. Interestingly, Miami has yet to play a game inside Notre Dame’s new Compton Family Ice Arena which opened last season. Miami’s first trip there will either be a CCHA playoff series at the conclusion of this season, or in the years to come, as a non-conference tilt. Here’s the full release at the newly redesigned MURedHawks.com (as an aside, the new design is hideous). Miami senior defenseman Steven Spinell was Miami’s player rep at today’s presser. In the second part of the doubleheader, Wisconsin will meet longtime WCHA rival Minnesota in one of their final regular season clashes before bolting the league for the Big Ten Hockey Conference.